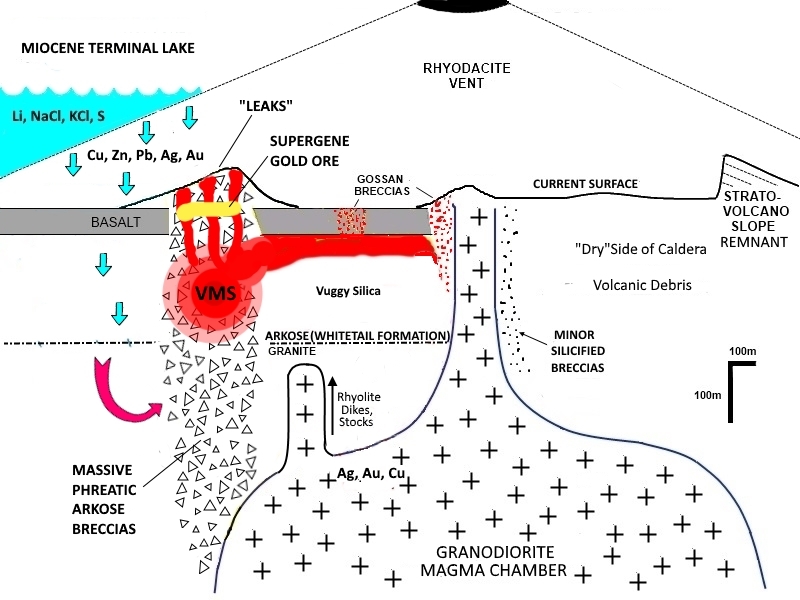 Because the rhyolite porphyry magma chamber beneath the Molly Marie Prospect was located beneath or bordering relatively shallow brine lakes, the deposits on the Prospect are called high-sulfidation VMS deposits. This type of deposit typically has high gold values. 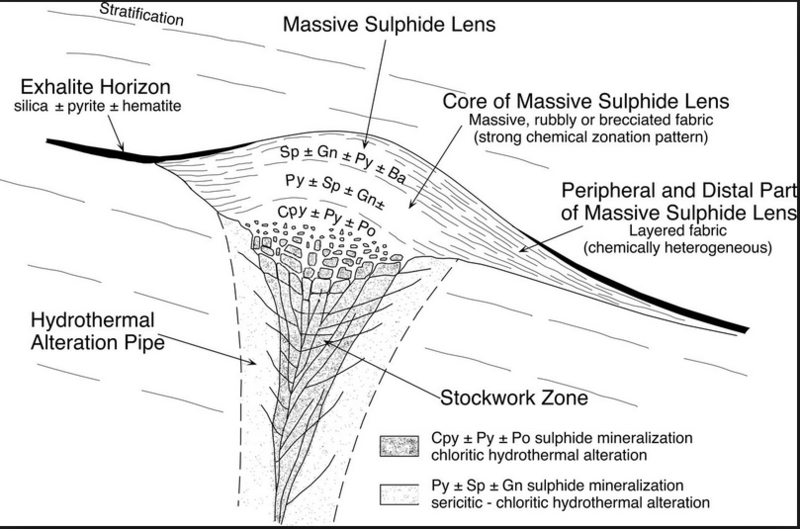 Below is a link to an excellent paper regarding high-sulfidation VMS gold deposits (which are gold-rich). The diagram below is from the paper and depicts the position of High-Sulfidation VMS deposits in shallow water near the shoreline of an ocean or brine lake. Ocean-floor high-sulfidation VMS deposits are rare in their own right; present-day examples being Eskay Creek and Greens Creek, but the deposits on the Prospect are another special subset of VMS deposits, called sub-seafloor, high-sulfidation VMS. A famous example of the sub-seafloor type would be portions of the famed Rio Tinto VMS deposit in Spain that has been mined for millennia. 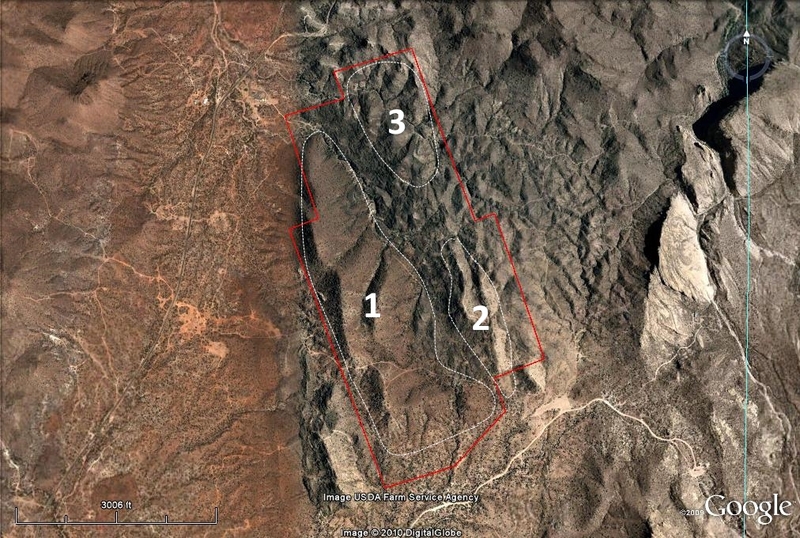 The upper portions were rich in precious metals, so much so that Rio Tinto is rumored to be the location of King Solomon’s mines. 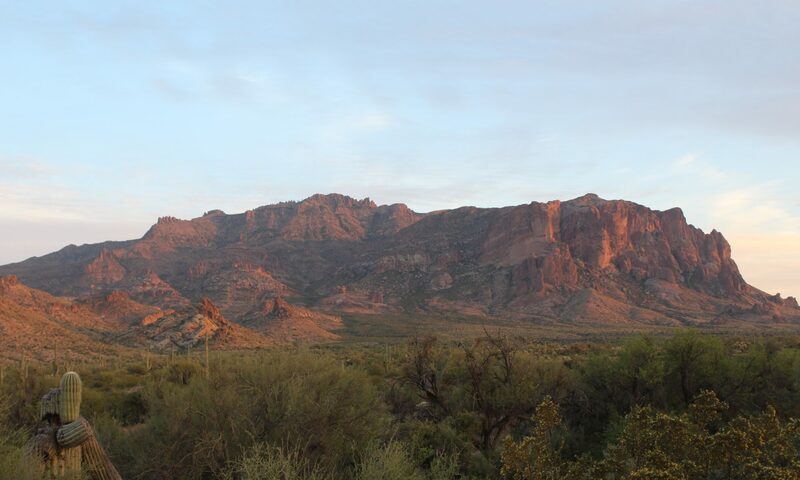 The nearby Goldfield mining district, approximately 2-1/2 miles away, was the result of the same basic ore-forming processes that took place at the Molly Marie. The Goldfield district is also located on a submarine collapse caldera located above a shallow-placed magma chamber. Goldfield had many small mines, and two of them (Mammoth, Old Wasp) were very notable for not only their documented bonanza gold grades, but because of their written description they appear to have been unrecognized as high-sulfidation VMS deposits. In the booklet, “Goldfield Mining District Geology and Ore Deposits”, John Wilburn describes the mines there and some of the ore. The Mammoth, was the highest producing mine, largely due to the “Mormon Stope” that was found in 1892 after it was struck 35 feet below “Weekes Wash”. This was supergene gold ore that ran hundreds of ounces to the ton. The Mammoth reported production of over 50,000 ounces of gold, but considering the high grade and the great amount of theft that was documented at that time, the production could have easily been more than double that. “The ore shoot was 8 feet wide and 50 feet in length. On the east footwall, free gold occurred with galena, anglesite, malachite, chrysocolla, and hematite in an extremely heavy ore 12 inches wide that assayed 244 opt gold and 56 opt silver. The sulfide ore was of limited size. At 35 feet in depth the ore values diminished. An old drift underground struck the ore shoot on the 1,022 foot level where gold values averaged 0.66 opt along 40 feet of drift. ” Author’s note: the 1022 foot level was that of the nearby Mammoth Mine. Wilburn also describes all of the ore in Goldfield as being heavy with “drusy quartz”. Drusy quartz consists of crystals that cannot be seen with the naked eye. Mr. Wilburn was spoken with about the Mammoth and The Old Wasp Mine. He had held some of the Old Wasp ore in his hands, and he stated that the Mammoth ore had significant galena also. Considering the bonanza-grade ore described, it is highly unlikely that an assay was performed for lead or zinc. The galena was reported, but it appears that zinc and the mineral “Marmatite” were not identified; zinc is the major player in high-sulfidation VMS deposits. Marmatite is the iron-rich variety of Sphalerite. 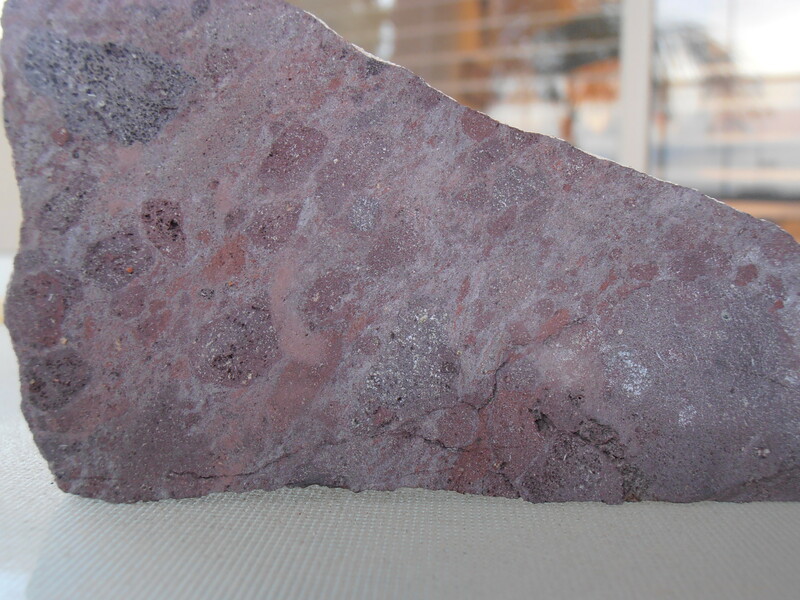 It is black, can be botryoidal like many manganese minerals, but has a red streak like hematite. Marmatite was the primary zinc mineral in the zinc-lead-silver-gold district of Leadville, Colorado. The highest grade ore was stated as being within or replacing brecciated arkose at the Mammoth stope. This is the same situation at the Molly Marie Prospect (replacement type, sub-seafloor, high-sulfidation VMS deposits), but it will be shown that the volume of breccia and the number and size of the ore bodies are magnitudes larger at the Molly Marie. There are also 2 different types of sub-seafloor VMS types on the Molly Marie Prospect: those that are in the abundant arkose breccias, and those that formed beneath basalt that acted as an aquatard. Below is a diagram to aid in describing the types of VMS deposits on the prospect by the Area that they are found. Below is a diagram of the different types of seafloor and sub-seafloor VMS deposits. It is believed that Area 1 would be combination of Types J, H, and L ( L because of the large quantity of limestone in the Whitetail formation). Areas 2 and 3 would be a combination of Types J and L.
The below gossan is found with frequency on the ridges in Area 1. It is believed to be VMS gossan from “leaks” from a much larger VMS system below. The actual vents are believed to have all been excavated and filled back in. This material is very friable and was not transported far. VMS Gossan from Area 1. 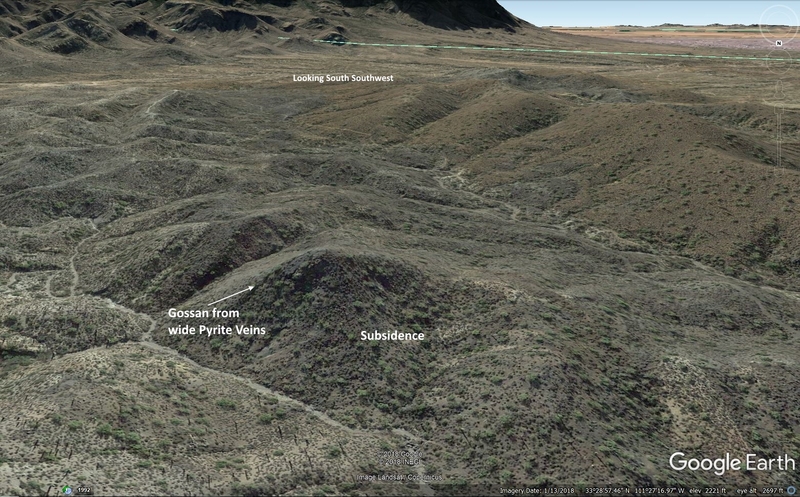 The centerpiece of Area 2 is a large VMS shown in the photo below that occurs beneath basalt and lies next to a large rhyolite intrusive(volcanic neck). There is a large exposure of gossan breccias near the top of the hill that betrays what lies beneath. Rings of different alteration zones surround this hill. The photo is looking SE, and on the east side of the hill is a large subsidence zone from 19th century mining (See the Great Mine page). 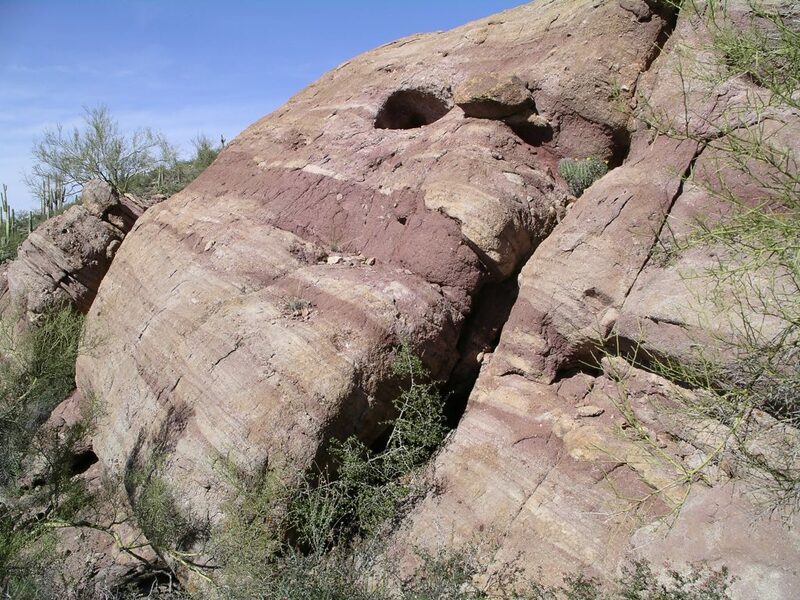 Below are photos of the massive gossan breccia that occurs near the top of hill. This assayed over 100 ppm Lithium, and even though it has been thoroughly leached by chlorides, gossan nearby ran 158 ppm Cu and 155 ppm Zn. Sulfates coating the gossan can be seen. On the southern toe of Cerro Negra, a large outcrop of the gossan shown in the photo below is exposed in a wash. When sawn, copper mineral staining can be seen. Note the high amount of silica. Below is an ore genesis model of the orebodies beneath pre-ore basalt that occurred in Areas 2 and 3. It is believed the size of the orebodies in brecciated arkose (the Whitetail Formation) in Area 1 have the potential to be much larger than the ones beneath the basalt because of the brecccia’s porosity and reactivity. The photo below is looking SSW, and shows the subsidence in a hill in Area 3. 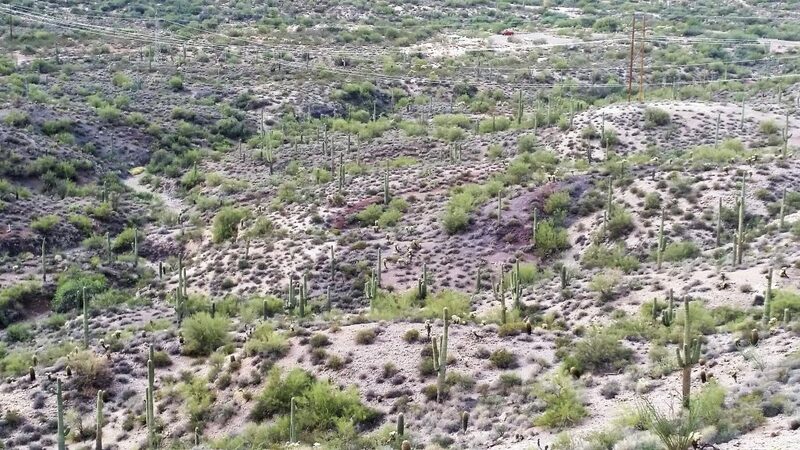 Because of the alteration on and around this hill, especially in the wash on the north side, and the abundance of chrysocolla and aurachalcite, it is believed the subsidence is caused by the oxidation of a VMS deposit or collapse (and/or mining) of the VMS system. This hill shown below with the subsidence crater is on the southern edge of a maar diatreme. Note the subsidence cracks on the left side of the crater and the adjoining ridge. In the wash, the basalt has been replaced by glassy jasper and milled breccias as shown on the alteration page. Below is a photo of the gossan depicted in the photo above. It has heavy boxwork structure indicating pyrite. On the eastern side of the hill with the subsidence zone above, there is a large zone of limonite after pyrite exposed in the wash and is shown in the photo below. Additionally, as also described on the Peralta-Fish Map page, there is great potential for a VMS deposit (Montana Tunnels type) with large vertical large extent in the maar diatreme in Area 3. This photo shows the striking rings of gossan in the maar diatreme. This gossan also had a high Lithium content. This is a photo of breccia from the maar diatreme on the northern end of the prospect. 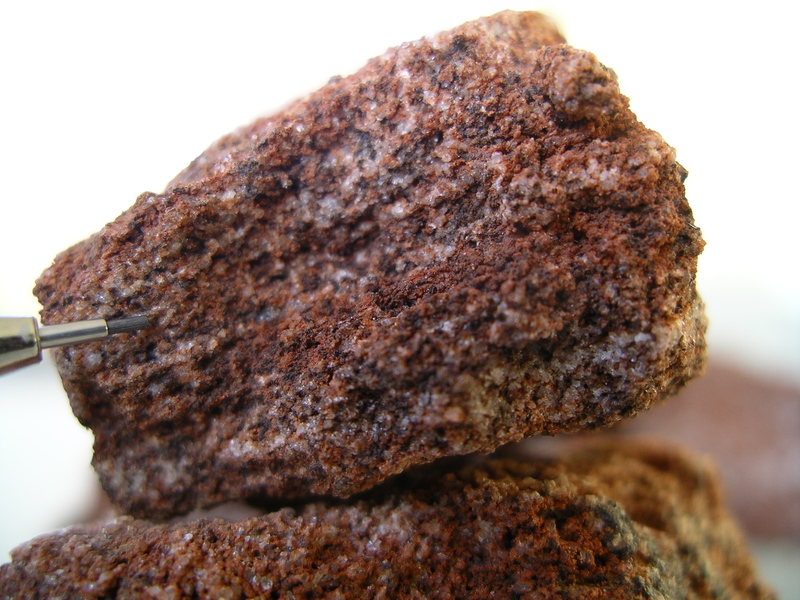 Migmatite can be seen. 1) Dry Phase. A rhyolitic volcanic field was formed during the beginning of regional rifting. Note: this region is on the southern end of the Basin and Range Province. Above the magma chamber(s) a high sulfidation gold deposit formed (not VMS). Vuggy silica is prevalent in this type of deposit, and is the bulk of massive lower-grade gold ore. The gold originates from the magma chamber. Yanacocha is an example of a high sulfidation gold deposit. Extensive banded veinlets are found at the Molly Marie, very similarly to the banded veinlets found above the high sulfidation gold deposits of Maricunga, Peru (see below). See alteration page for more photos of the banded veinlets. 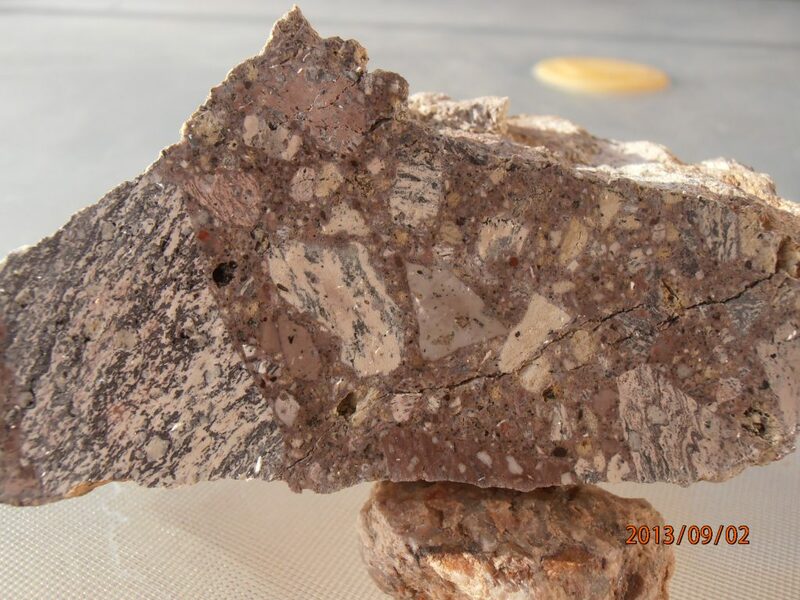 Below is a sawn piece of the Rhyolite porphry (wet) found at the volcanic neck. 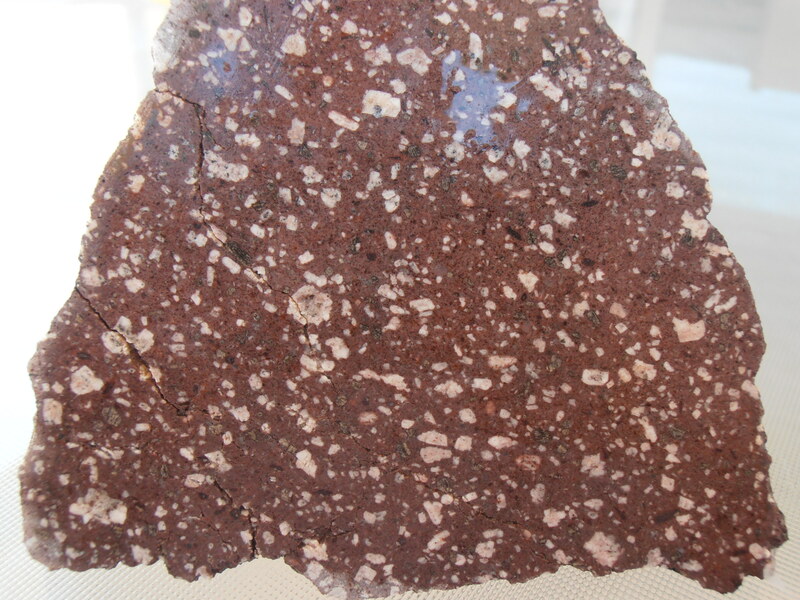 This is a true porphyry, enriched in metals and is a deep red in the field. Some of it is very magnetic. It is believed this is the source of the gold for the high sulfidation gold deposit. 2) Wet Phase. During this phase, the volcanic field is now inundated by the brine lake(s) that have grown and now cover much of southern Arizona. 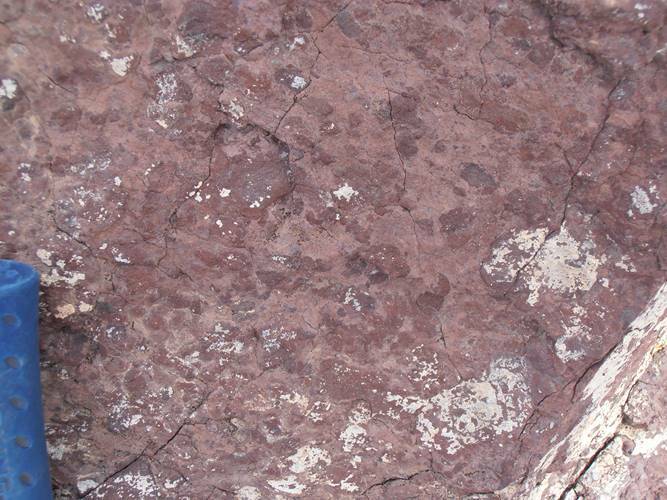 The metals, including gold, are leached by brine from the regenerated volcanic debris comprised mostly of the same metal-enriched Rhyolite porphyry. The metal-enriched brine circulates to the boiling zone and the brine is boiled-off near the magma chamber. The metals and sulfur precipitate (above diagram). It is proposed that during this phase the brine also leaches gold from the vuggy silica of the dry phase, and becomes even more gold-enriched before it is precipitated at the boiling zone. The process of re-mobilizing gold from the vuggy silica and combining with the gold leached from the volcanic debris is believed to be responsible for the legendary richness of the ore in the district. The key to the idea of the “wet phase” was the discovery of high quantities of Lithium in gossans found throughout the property; the largest gossans have over 100 ppm Lithium. In the sub-basalt geologic model above, there is ore shown just beneath the basalt. The reason for this is two-fold: The basalt acted as an aquaclude to rising fluids, and the upper portion of the Whitetail formation has a high percentage of limestone cobbles, sand, and boulders. This resulted in a hybrid VMS-limestone replacement style ore.
3) Supergene Phase. This phase is slow and occurred after the lakes receded. Meteoric water and residual chlorides leached the metals from the hypogene ore, and deposited them at the water table. Because of the water that is available to facilitate the process, these bonanza-grade deposits most often occur near or below washes that cut the orebodies. A VMS, whether sea-floor or sub-sea floor can have an “exhalite horizon as in the diagram below. The silica+hematite is can be jasperoid, banded chert, or banded jasper. This will be described further on the Exhalite page; jasperoid beds and banded chert occur extensively on the Prospect, and are indicators of a great VMS deposit. The below picture/diagram below was created to show how much potential there is for VMS deposits on the property. The rhyolite intrusions were estimated from rhyolite dikes and plugs that outcrop, and the extent of basalt hornfels. 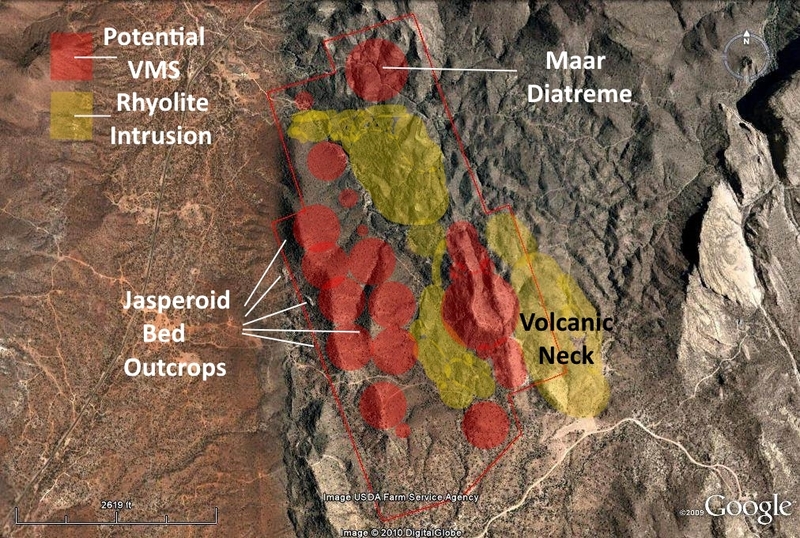 The potential locations of VMS deposits were determined from jasperoid bed outcrops, seismic work that indicates pits, intense black chlorite alteration, disturbed areas that were not seismically tested, amphibolite scattered above the phreatic breccias, massive epidote alteration, marbilized limestone cobbles and boulders, gossan high in Lithium, and gold assays. 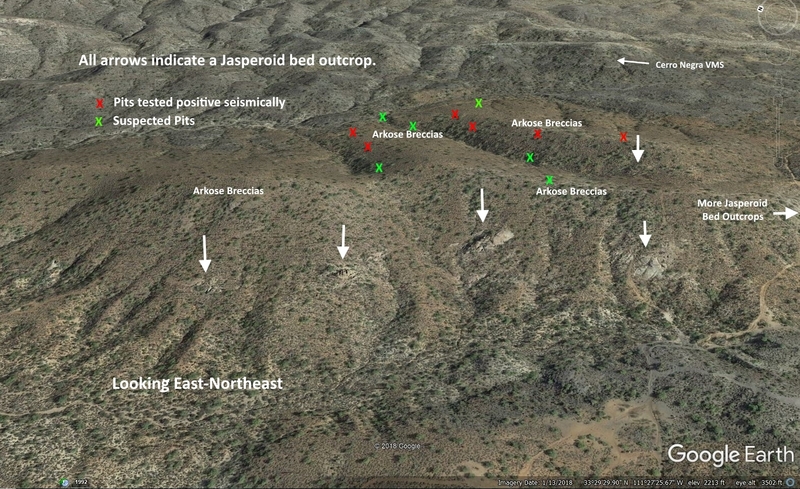 The picture below is of one outcrops of the aquifer-hosted jasperoid beds. Two assays of chip samples of the jasperoid beds returned values of .02 opt Au. The google earth photo below is eastward-looking and shows the location of many of the Jasperoid outcrops in Area 1. The beds dip to the east. On the ridges above the projected origin of the beds can be found abundant hornblende, marble, and marble replace by silica. It is here, beneath these ridges, it is believed there is the highest potential for large VMS deposits because of the porosity of the breccias and the indication of several previously mined pits. Most of the seismically tested and potential pits are rimmed with black chlorite. There are several very shallow prospect pits in the basalt areas in Areas 2 and 3, and between them that apparently were dug to follow Chrysocolla. There is still some Chrysocolla to be found in the basalt and the arkose breccias, and its origin has been a mystery. It is now believed that sulfide debris from the VMS deposits once covered the basalt, and the copper was leached out and precipitated in the top 5 to 10 feet of basalt. The sulfide debris was eroded away, leaving the Chrysocolla in the basalt behind. 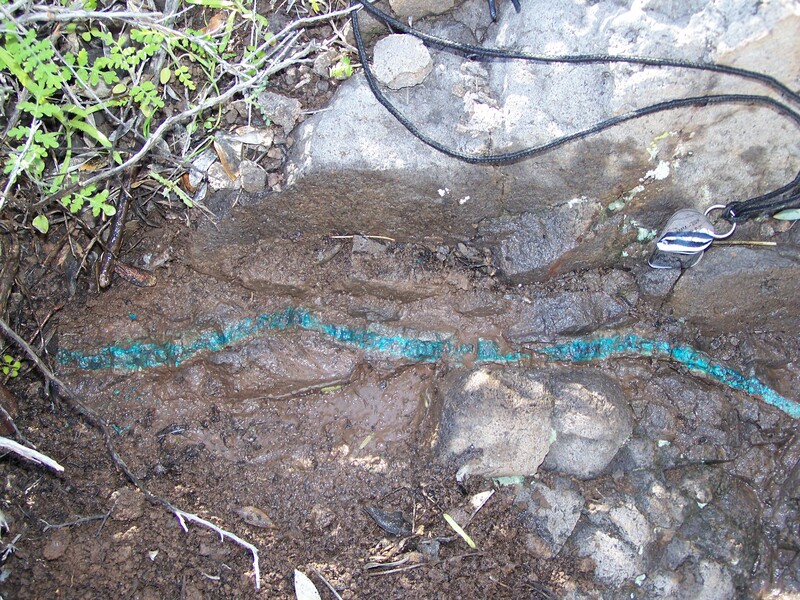 Below is an untouched Chrysocolla vein in Area 3. 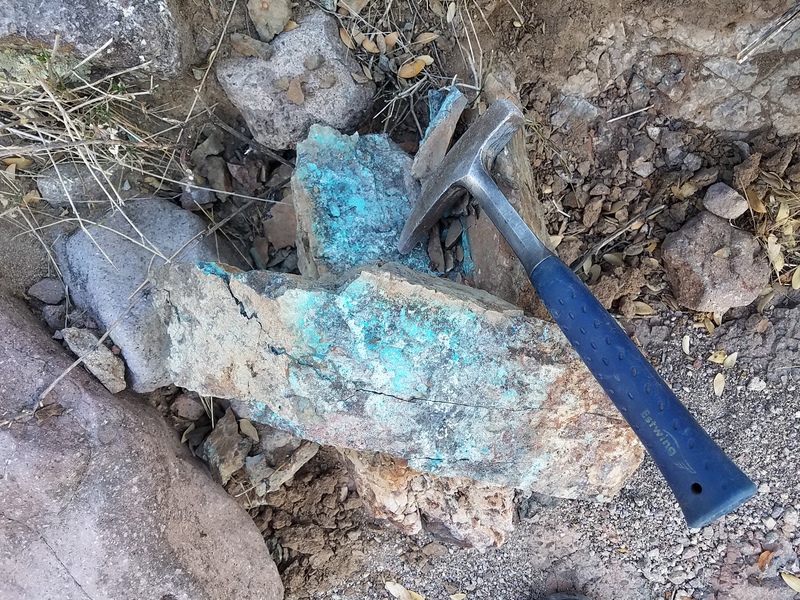 Below is a photo of another piece of Chrysocolla-saturated basalt wrested from the ground in Area 3. Although less photogenic, many of the VMS gossans are inundated with small pieces of Aurichalcite, a zinc-copper carbonate, especially in Area 3.